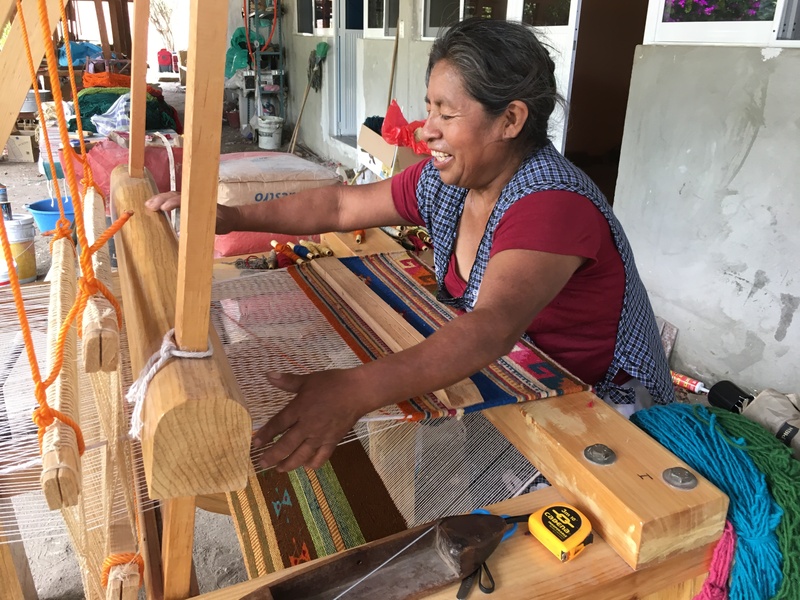 Teotitlan del Valle is a colorful village of rug-makers just outside of Oaxaca in southern Mexico where Zapotecs have produced rugs for many generations. How much time does it take to hand-make a rug? Answer – a lot! After sheep are sheared, wool is washed, carded, and spun into yarn, then the yarn must be dyed. 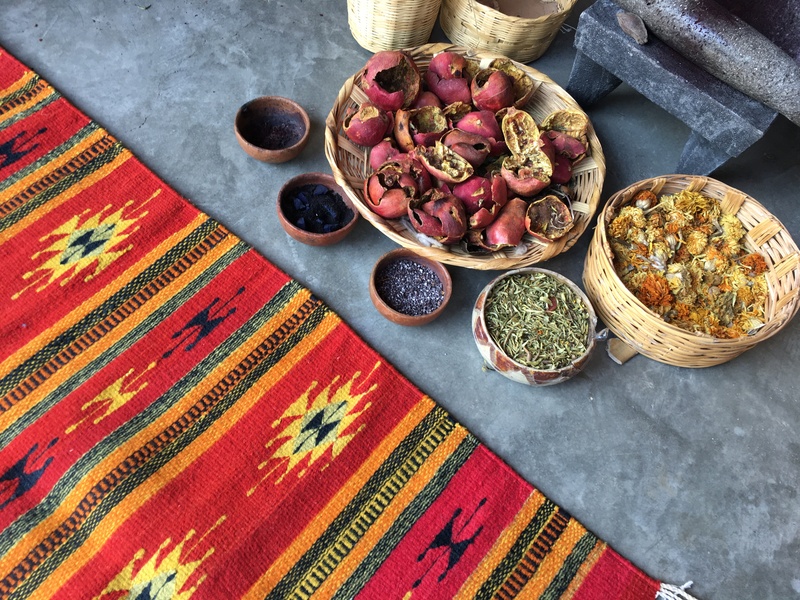 Some weavers still use all natural materials for color, such as indigo for blue, nut shells for brown, marigolds for yellow, and cochineal, a small insect that feeds on the prickly pear cactus, for brilliant magenta. Others have now switched to chemical dyes, so if you have a strong preference for natural, do your homework. 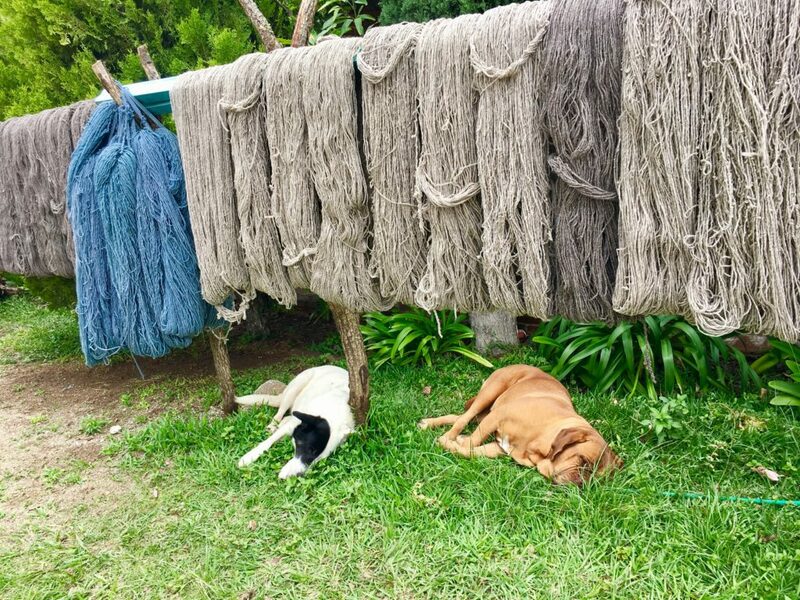 You may see rows of skeins hung out to dry on long lines, some with furry guards underneath. Looms must be warped, a time-consuming process, and then the weaving begins. 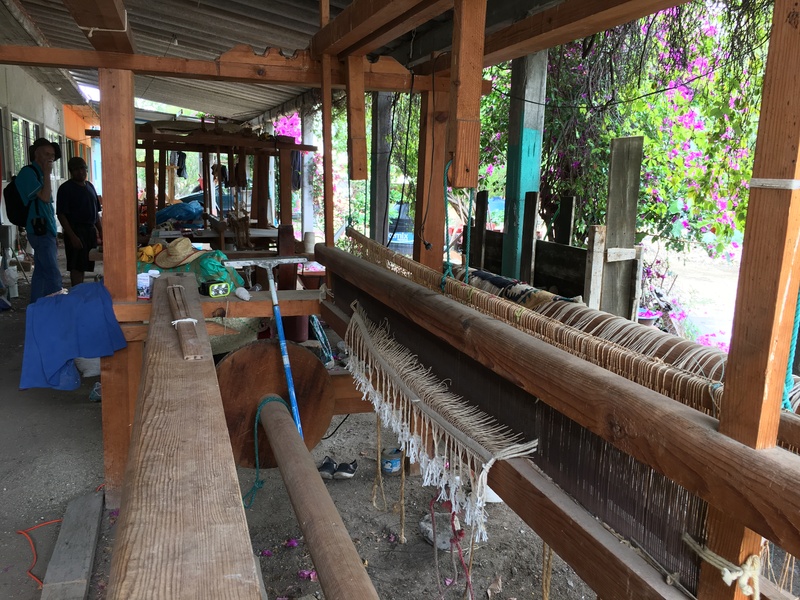 Some of the looms are huge, in order to make large room-sized rugs. The time it takes of course depends on the size of rug and complexity of design. While many rugs are very traditional, others take a more contemporary approach. 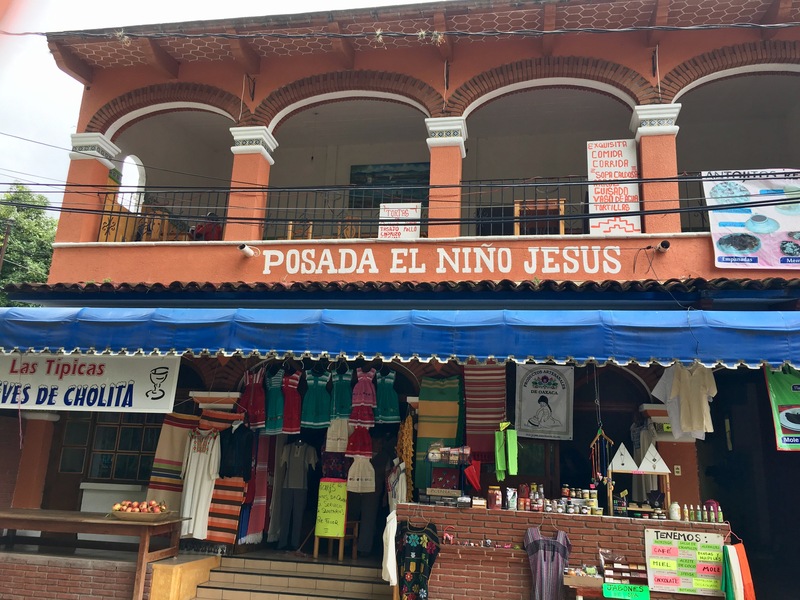 You’ll find small shops as well as larger enterprises. There are different levels of artisan weavers, with master weavers charging the highest prices. Take note of how much you want to spend, and what your intended use is – on the floor or as a wall hanging. Feel the thickness of the fabric and notice the tightness of the weave in determining the level of quality. 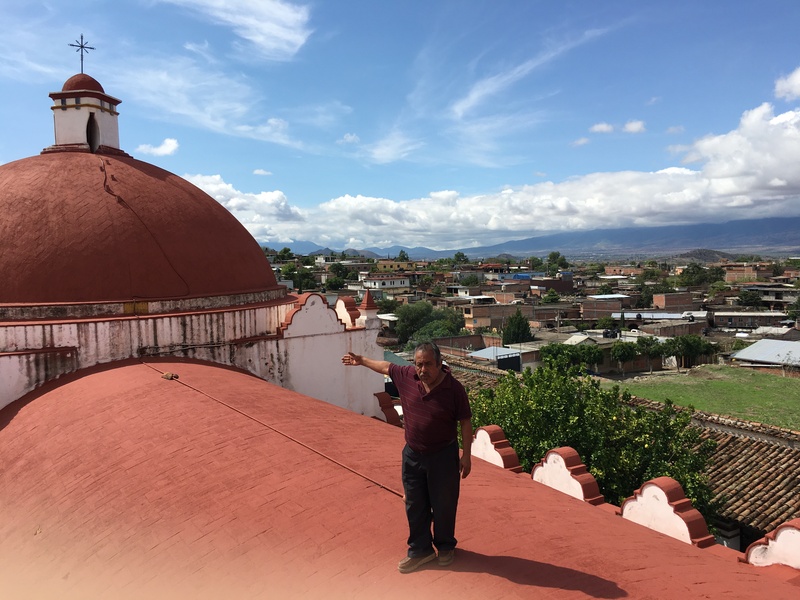 The village of Teotitlan del Valle was founded in 1464 (although weaving dates back to 500 BCE here, the earliest using cotton and back-strap looms). 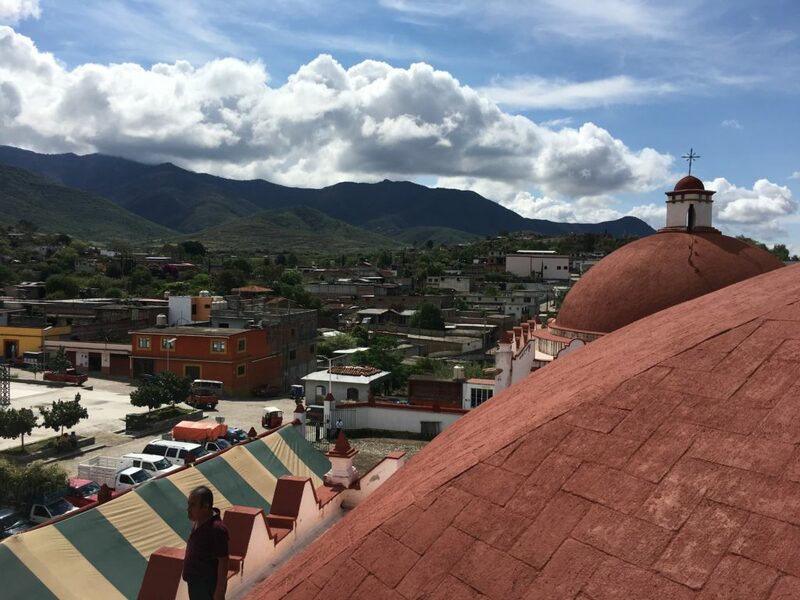 While you’re in Teotitlan, you may want to climb up the steep narrow stairs in Preciosa Sangre de Cristo Church (which was begun in 1581, though not finished until 1758) for an outstanding view of the area. On a clear day, you can see far off into the surrounding mountains. Unlike in the US, where there are railings everywhere for safety, here you are free to walk out on the roof for the best views. Just watch your step! 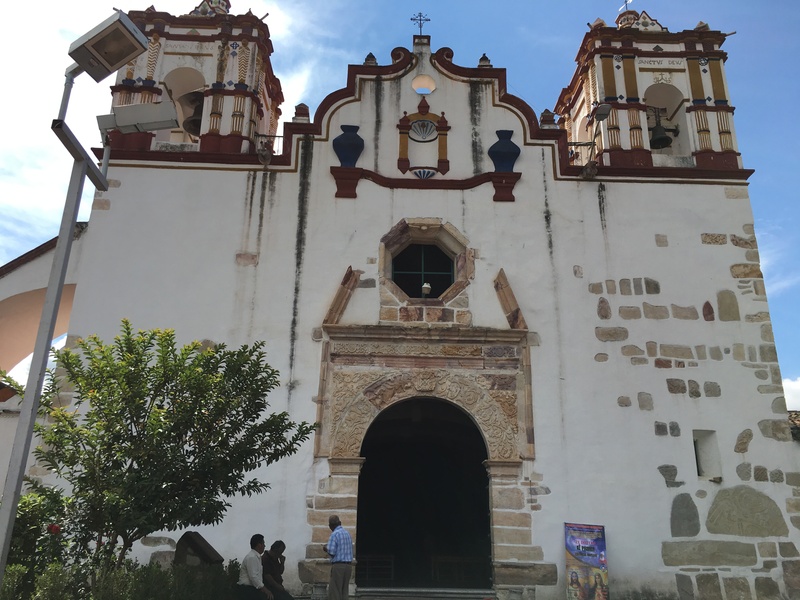 The church was built on the site of a Zapotec temple that was destroyed when the Spanish arrived. You can still see some of the original construction in the foundation. 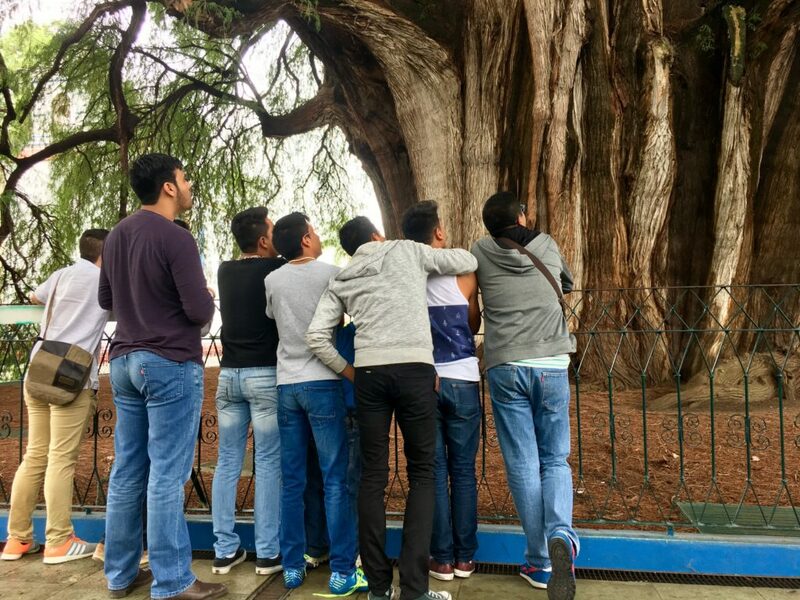 Between Teotitlan del Valle and Oaxaca City you’ll find the town of El Tule, with its famous giant tree. 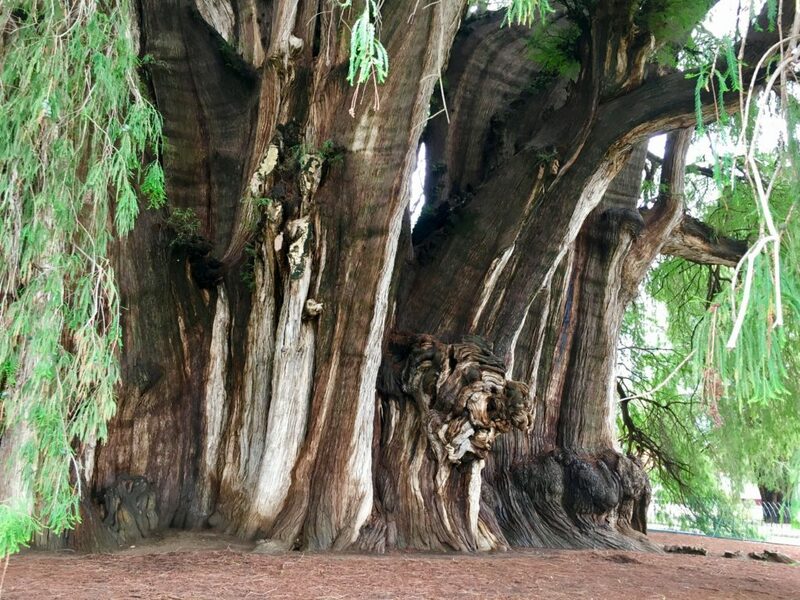 It’s said to be the largest circumference tree in the world. For a small fee, you can enter the park and view this Montezuma cypress closer up. Some people say you can see the images of animals in the trunk. 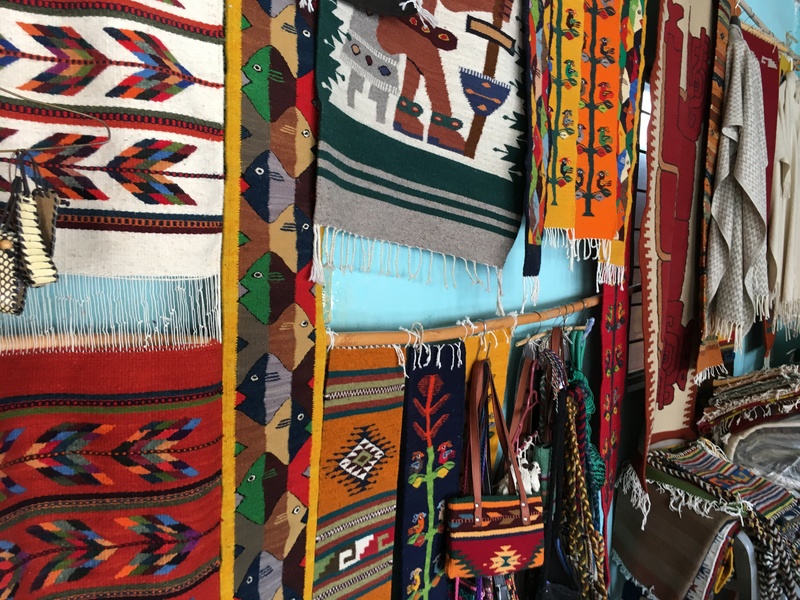 Take time to wander around the town of El Tule, as there are many shops selling beautiful local handicrafts, including clothes, purses, pillows, tablecloths, rugs, and if you’re thirsty, Oaxaca’s famous Mescal. By now, you might be hungry as well, so check out the local market, where you’ll have your choice of many different food booths full of flavorful fare. 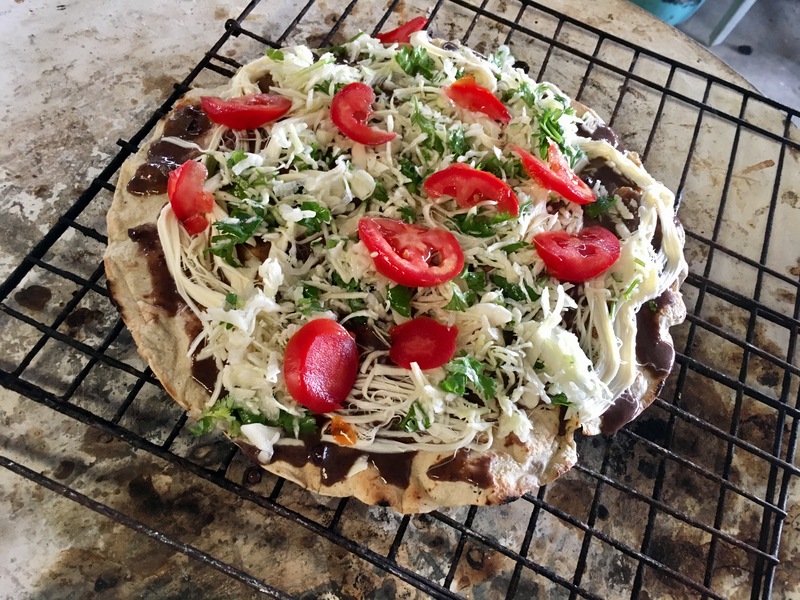 A Mexican-style pizza called a tlayuda will certainly fill you up! 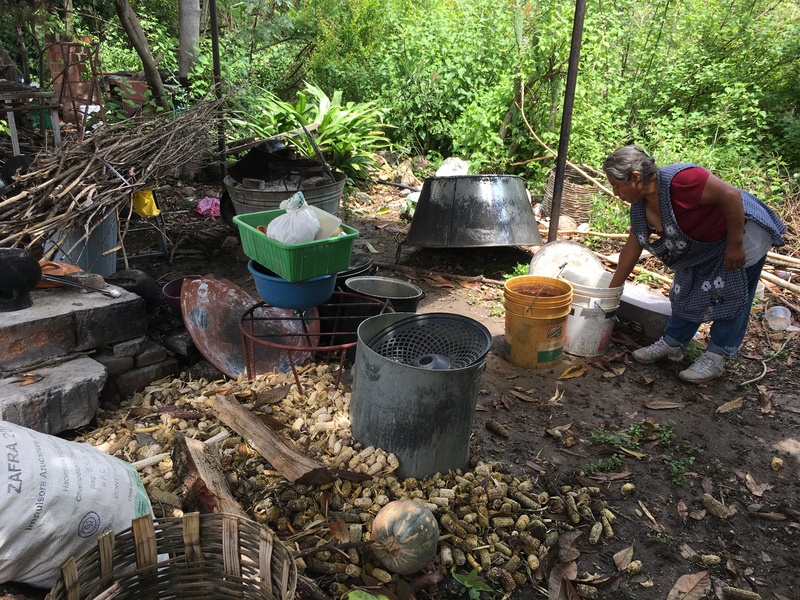 Or you may prefer to try the moles, tamales, memelitas or empanadas. Wash it down with some local chocolate de agua or de leche. 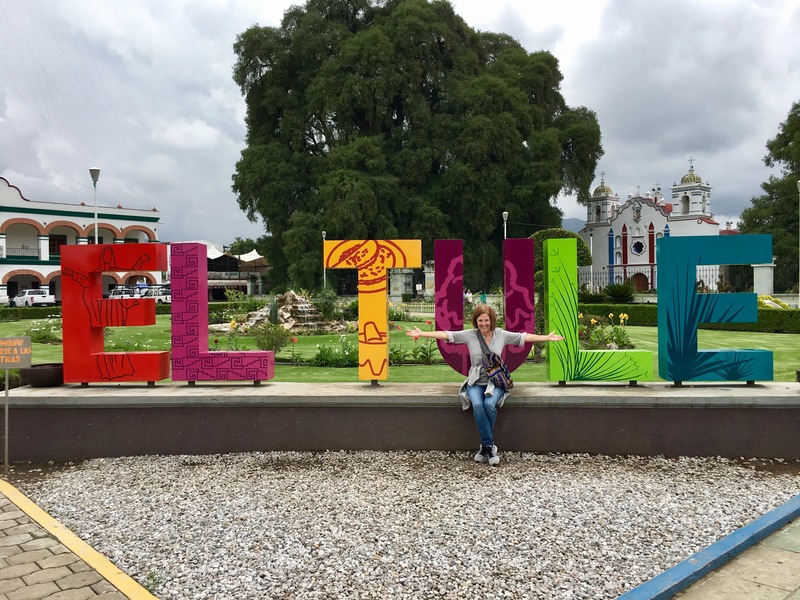 You can visit both Teotitlan and El Tule on a tour, or it’s quite easy to take a bus or collectivo (group taxi) and go on your own, giving you more flexible time to wander. 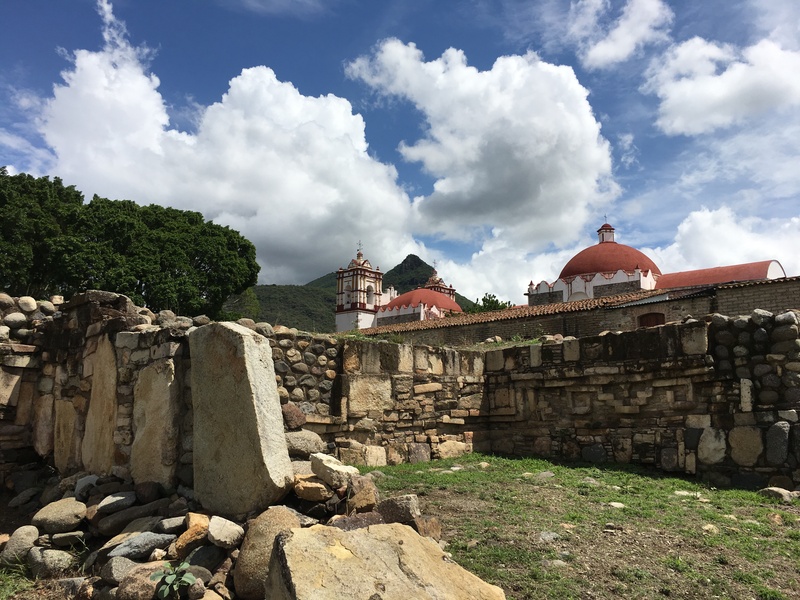 Either way, enjoy your visit to these two charming towns near Oaxaca! Thanks Lynn for this informative post. 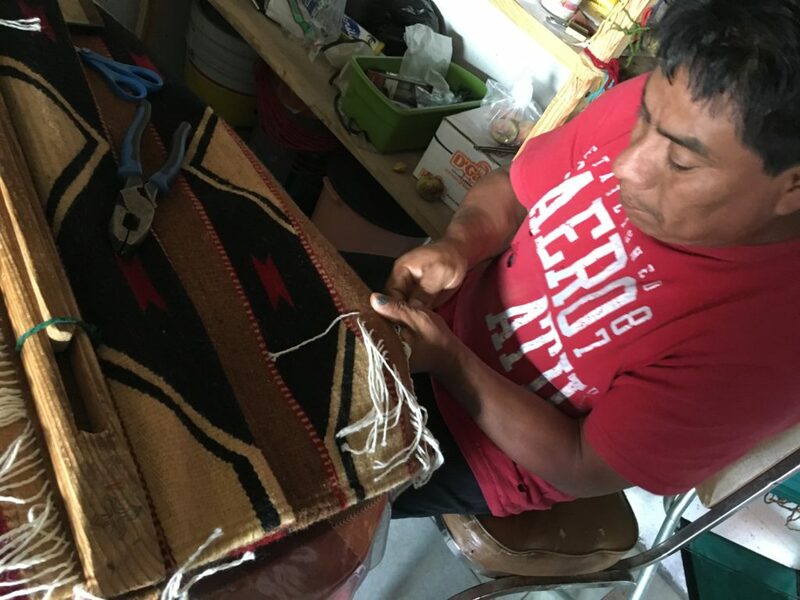 Gave me insight into the work and skill that goes into making these artisan rugs.